The most common football injuries are not ACL tears, broken collar bones, or concussions. The most common football injury is the one that no one really considers an injury at all. The scrapes, scratches, abrasions, turf burns, and other skin injuries. In fact, this is one of the leading reasons why patients see physicians. As team physicians, coaches, and even as players, we need to know how to best treat these injuries for quick and safe recovery. Unfortunately, physicians are never taught how to treat wounds. There is no training in medical school or during residency on how to treat wounds. None. Hard to believe? It’s true. Unless you do a wound care fellowship, you will not be formerly trained on how to treat wounds appropriately. While training as a physician in Chicago, I have had the opportunity to work with and attend multiple lectures by Dr. William Ennis, president of the Association for the Advancement of Wound Care. This has given me invaluable experience and insight into the treatment of basic wounds that we encounter on the football field and in every day life. This is the most common type of wound we will encounter as weekend warriors, coaches, parents, and players. If you look at the pictures to the right they are examples of abrasions. An abrasion is a disruption in the outer few layers of skin, but not completely through the skin. If the skin is completely removed and you can see muscle, bone, tendons or other below skin structures, you have more than a simple abrasion and need to see a physician for what will likely be stitches and or a more complex procedure. 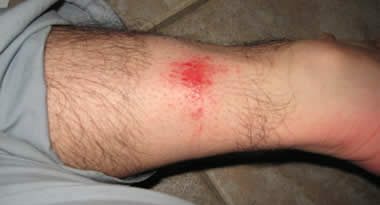 Abrasions are irritated and scraped skin that is immediately painful with some blood at the site of bleeding. If you ignore this for a while you will see crusting over or scab formation. We have all had these. When we fell and skinned our knees, or if we’ve caught a cleat in the back of the leg. These are common, and we all know what they are. So what do we do about it? Use a clean cloth, cotton ball, or material and apply direct pressure until the bleeding stops. Normally a few minutes. Then proceed to clean the wound. The site needs to be rinsed and cleaned properly. Do not use cytotoxic solutions. These are solutions that are toxic to cells and will damage viable tissue and impair proper healing. Avoid alcohol, peroxide, betadine, iodine, merthiolate, mercurochrome, chlorhexadine, sterile water, and other concoctions. These are all cytotoxic and will destroy tissue. Use a solution like normal saline to clean wounds. This is the same solution that is given in an IV format to athletes that are dehydrated and you should have some on your sidelines. This solution does not burn or hurt and does not irritate the wound. Most physicians have access to normal saline and you can usually buy it over the counter from any pharmacy. If you are a trainer and can’t get your hands on normal saline, you can easily make it by adding 1/4 tablespoon non-iodized salt to sterile water. Band Aid also makes a wound cleaning solution you can purchase from any store. Use this in large quantities to clean the wound. You can also pulse the wound by squirting this into and around it. If you have one of those 1 liter normal saline bottles, you can poke three holes in the top with a 18 gauge needle and use that as a squirt bottle to clean the wound. Or alternatively, you can use a 20mL syringe and an 18 gauge needle. The point is, just clean it with normal saline however you choose. Make sure you remove grass, glass, dirt, or other foreign material from the wound site. Stop any residual bleeding by applying pressure again. Next, is the part everyone screws up. You want to keep the wound moist, wet, and sealed. They have studied this since the 1960s. Wet wounds heal faster, better, stronger, and with less scarring. You want to use an occlusive dressing and seal it all in to enhance the healing process. There are three types of dressings that can be used; films, hydrogels, and hydrocolloids. The most common commercial films available are Tegaderm, Bioclusive, and Opsite. These are plastic films that seal everything in and protect the wound. The most common commercially available hydrogels are Spenco 2nd Skin and Vigilon. These are membranes that sit over the wound and are 90% water and allow the wound to heal in a moist environment. Hydrocolloids are gelatinous membranes that sit over wounds they absorb juices from the wound. Examples include DuoDERM, Comfeel, and Tegasorb. In most sport injury applications, an occlusive dressing like Tegaderm is usually plenty for most superficial wounds. In fact, I actually prefer waterproof band aids for most applications. Using an occlusive dressing protects the wound and allows it to heal undisturbed. Further, this not only allows the wound to heal in a closed environment, but also allows the wound to heal in a freely movable, soft, and pliable environment and does not interrupt practice and training. For more extensive and deeper wounds you may want to consult a physician and use a different method. So what do you do if you don’t have Tegaderm around? My favorite substitute has been the waterproof band aids made by Band Aid. They function exactly like Tegaderm. They seal in the good stuff, and keep out the bad stuff. The wound is allowed to heal appropriately. You can also use Solosite Wound Gel to wet the cotton on the inside of the band aid. If you can’t find that, just use some normal saline (or contact lens saline solution) on the cotton patch in the band aid. If you don’t have normal saline use some of the above suggestions; Band Aid wound cleaning solution or you can use saline solution for contact lenses (close enough), or make your own. Prepare the area by using a trimmer and trimming any hair that may hinder adhesion of the dressing as we have in the photo. Shaving irritates the skin and leads to infection. Apply the dressing and leave it sealed for seven days. If it is a really nasty wound or there was a lot of initial bleeding of oozing, change it in 3 days. You want this dressing to be applied and not removed for at least seven days. Then you can check on it and see if you need to continue the wound treatment protocol. Sometimes you will need to continue this for another seven days, depending on how it looks. The benefit of using the Band Aid waterproof band aids is that they are waterproof, you can keep them on all the time, shower with them, swim with them, and they don’t come off (we’ve tried). The athlete pictured at the right was involved in a tackle football game and was kicked in the back of the leg with a cleat. During the game, we just cleaned the wound with normal saline and taped it up with our usual medical tape and foam wrap to apply pressure and keep him in the game. Later, we cleaned the wound thoroughly with lots of normal saline, debrided and removed small dirt particles, removed some dried blood and areas that appeared to start scabbing, trimmed the hair in the area around the wound, applied the water proof band aid with some normal saline to wet the cotton patch on the inside. It took seven days for skin to reform, heal and close up. We removed this after seven days and we decided he will no longer need this dressing. The skin already regrew, was fully formed, and there was no scabbing or scarring. Had we left this to “air dry” he would have a scab there for months. The scab will come off occasionally and re-injure the area. Further, the skin that grows back will be weaker and have less tensile strength. Yes, it will smell bad if you smell it. There is a certain amount of bacterial load that is found on skin and necessary for healing. Do not be alarmed and don’t think this is an infection. Of course, if the skin around the wound starts turning red, becomes tender or painful, and if you see puss developing, you need to consider infection, clean the area with saline, and may even need antibiotics. Let your team doctor decide. Proper wound care is never taught in medical school, and most physicians never receive formal training in the most common medical problem; a skinned knee. Proper wound care can alleviate many skin problems and lead to stronger skin and a faster return to play.